The Virginia Cavaliers are the 2019 NCAA National Champions for men’s basketball. Coach Tony Bennett and his team finally won the big one. It was well deserved as well: a year ago, Virginia was the laughing stock of the NCAA after finishing a 31-3 season by losing to 16 UMBC in the first round of the NCAA tournament. Now, they’ve cut the nets down in Minneapolis. Let’s take a look at the ups and downs of their last two years. At the beginning of the 2017-18 season, Virginia was supposed to be a rebuilding basketball team after coming off a second-round defeat to 4 Kansas as a #5 seed in the East Region of the NCAA tournament of the previous year. They started the season unranked by the AP poll, despite having Kyle Guy, a sophomore and former McDonald’s All-American. They were even projected to go 5-13 in ACC conference play by a Winston-Salem Journal writer. They responded by going 6-0 to start the season and became a #18 rank after winning the NIT Season Tip-Off to get their fifth and sixth wins. They climbed up the AP poll and won two more games before suffering their first loss of the season to 18 West Virginia. That was on December 5th. They wouldn’t lose until February 10th. That meant they mowed through powerhouses like 12 North Carolina, 4 Duke, and 18 Clemson. The loss on February 10th? A 1-point OT loss to Virginia Tech. If you’ve been keeping track, Virginia is now 23-2 with a 12-1 ACC record. The Cavaliers would rack up five more wins to enter ACC tournament play with a 28-2 record, 17-1 in the ACC. After cruising past the ACC tournament en route to a championship, the Cavaliers were rewarded with the top overall seed in the NCAA tournament. Despite ACC Sixth Man of the Year De’Andre Hunter suffering a broken wrist, Kyle Guy and Ty Jerome were determined to lead the Cavaliers to their first National Championship after finishing with a 31-2 record. Nothing else could go wrong. Until it did. Virginia was tasked with defeating 16 UMBC in the first round of the tournament. No big deal. Up to this point, #16 seeds are 0-135 against #1 seeds in the tournament. On top of that, the Retrievers were 12-4 in a relatively easy American East conference. After halftime ended with the score 21-21, the Retrievers shifter gears. The Cavaliers were outscored in the second half 53-33 and lost embarrassingly by 20 points, becoming the first #1 seed in NCAA tournament history to lose to a #16 seed in the first round. What followed was a heated debate regarding the Henry Iba Award, which is awarded to the best coach in the NCAA. The 2017-18 winner was Virginia’s Tony Bennett, which had some controversy around it because his team had lost to a #16 seed despite finishing with a 31-2 record in the regular season. The following year, Tony Bennett, Kyle Guy, Ty Jerome, a healthy De’Andre Hunter, and the rest of the Virginia Cavaliers were thirsty for redemption; the AP poll granted a #5 seed to Virginia to start the season. After winning their first 16 games, including wins off of 25 Wisconsin, 24 Maryland, 9 Florida State, and 9 Virginia Tech, the Cavaliers suffered their first loss to a #1 seeded Duke on the road. After another loss to Duke and a loss to #12 Florida State in the ACC tournament semifinals, Virginia was granted another #1 seed in the NCAA tournament after finishing 29-3. They joined Duke and North Carolina as #1 seeds from the ACC, making this year only the second time in NCAA tourney history that three #1 seeds came from the same conference (UConn, Louisville, and Pitt were all #1 seeds from the Big East in the 2009 tourney). People had their doubts regarding the Cavaliers knowing what had happened just a year earlier, but Virginia shut every mouth when they stormed past 16 Gardner-Webb, 9 Oklahoma, and 12 Oregon to reach the Elite Eight. After a five-point OT win against 3 Purdue, Virginia made it to the Final Four for the third time in school history and looked to get to the National Championship game for the first time. 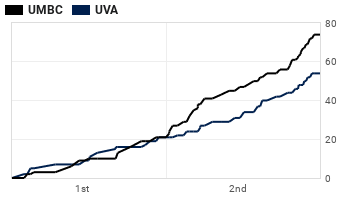 Needing to beat 5 Auburn to get there, Virginia was down by two points with 0.6 seconds left in the game when Kyle Guy was fouled while shooting a 3-pointer. He was awarded three free throws and made them all, putting the Cavaliers ahead 63-62 to win the game and go to their first National Championship to face 3 Texas Tech. After tying the championship game 68-68 and forcing overtime, the Cavaliers went on an 11-0 run and finally ripped the monkey off their back by winning 85-77. It was done. The Cavaliers redeemed themselves in the best way possible. Kyle Guy and De’Andre Hunter were both named to an All-American team at the end of the season after finishing with 15.4 PPG and 15.2 PPG respectively. All is now right in the John Paul Jones Arena in Charlottesville, VA because there is a National Championship banner that hangs alone in the rafters.